Click the image above to download Double Up bag stuffers for Family Fare, VG’s and ValuLand. Administered by Fair Food Network and offered at 45 SpartanNash corporate-owned stores throughout Michigan, the Double Up Food Bucks produce incentive program is a national model for healthy food initiatives with support from federal, state and private sources. The Double Up Food Bucks program enables Supplemental Nutrition Assistance Program (SNAP) participants to earn free produce when they buy fresh fruits and vegetables with their SNAP benefit at participating retailers. In partnership with Fair Food Network, SpartanNash has offered the Double Up program at select Family Fare Supermarkets since 2014, expanding the program to VG’s and ValuLand for the first time in 2017. In total, 45 SpartanNash corporate-owned stores in Michigan participate in Double Up Food Bucks (see below for full list of participating stores), making it easier than ever for SNAP store guests to take advantage of the program – and double their buying power when it comes to fresh fruits and vegetables. FAQs about the Double Up program and the temporary program pause can be found at shopfamilyfare.com/DUFB, shopvgs.com/DUFB or shopvaluland.com/DUFB. When the program resumes in June, store guests will once again be able to earn Double Up Food Bucks at all participating locations. SpartanNash is the largest grocery retailer to offer the program in Michigan, investing in the technology to easily activate the program with customers’ yes accounts. The Double Up Food Bucks program exemplifies the company’s commitment to corporate responsibility by providing SNAP customers with easier and more affordable access to healthy produce as well as supporting our local communities and Michigan farmers. Double Up is available in more than 160 farmers markets, farm stands and other retailer outlets, as well as more than 100 full-service grocery stores, including many SpartanNash independent customers. 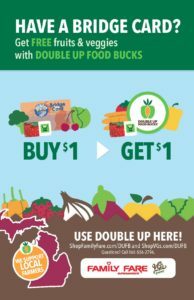 For more information on the Double Up Food Bucks program and the 45 Family Fare, VG’s and ValuLand stores participating, email corporate.responsibility@spartannash.com. Want a chart showing which fruits and vegetables are available in Michigan during which months? Want more information on how to store, prepare, cook or preserve Michigan’s great fruits and vegetables? Check out MSU Extension’s Michigan Availability Guide and Michigan Fresh Fact Sheets. Paw Paw – 847 S. Kalamazoo Ave.
Boyne City – 430 N. Lake St.
Gladwin – 1204 State St.
Houghton Lake – 3561 W Houghton Lake Dr.
Mio – 305 Morenci Ave.
Oscoda – 5463 N. Huron Rd. Rogers City – 100 S. Bradley Hwy. Roscommon – 409 N. Fifth St.
Standish – 533 S. Main St.
Lansing – 3800 W Saginaw St.